Start-up businesses and small traders are being given the chance to secure their own pitches across North Norfolk. It follows a decision by North Norfolk District Council to increase the number of concession pitches across the area. It will increase consumer choice, benefit taxpayers and open up more opportunities for local businesses. Judy Oliver, portfolio holder for asset commercialisation, said: “Our concession locations have always been popular and many businesses have come back year after year because of the opportunities the sites provide. The sites are in places such as busy car parks and seaside promenades and the concessions typically include hot food and ice-cream vans, but NNDC is hoping to expand the offerings and will consider any business that wants to bid for a pitch. 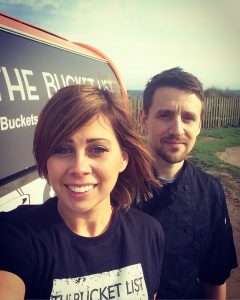 Two supporters of the concessions scheme are Nathan and Adele Boon (pictured), who signed a three-year deal last season on a pitch in Overstrand for their business, The Bucket List, which sells buckets of chips with homemade toppings. Adele said: “It had been an idea we had wanted to pursue for a while but we needed the location to be just right. The concession at Overstrand gave us a very well-kept position overlooking the beautiful North Norfolk coast. Having the site has given us a fantastic concept and created the ability to grow our business fast. North Norfolk’s concession businesses have traditionally operated between April and December but NNDC is looking to bring the 2018 start date forward to March, so that businesses can make the most of Easter. To apply for a concession pitch, visit www.north-norfolk.gov.uk/concessions. Applications must be submitted by early January. This entry was posted in Cromer, Home Page, North Walsham, Sheringham and tagged beach, chips, eating out, food, north Norfolk, North Norfolk District Council, seaside on October 19, 2017 by Gay Webster. A move to Norwich to bring a taste of homestyle Mexican dining to the city was a new start for chef-patron Jason Coolbaugh and his family. Having been “charmed” by the city on an impromptu visit last year, they considered it the ideal place to relaunch their restaurant after a catastrophic series of events saw the closing of their London business. And in opening Blue Agave, they have breathed new life into the Grade II listed former Overburys solicitors office in Tombland, where they opened at the end of May. Jason, his French-born wife Sophie and daughter Hana, nine, live off Waterworks road in the city. Jason is originally from California and was brought up on Mexican food. His dreams of a Mexican restaurant first came to life in 2010, when he opened a 12-seater hole-in-the-wall in London with his wife Sophie. But a catastrophic flood destroyed their business and finances and they had to close the restaurant and think about starting over outside the capital. The venture is a real family affair with Hana working with the designer on the children’s menu and Sophie fitting in social media, design and marketing around her job with Norwich music streaming startup SupaPass. As well as making its food in house from Mexican-sourced ingredients, the restaurant also serves beer from the Cerveceria Mexicano brewery, as well as no fewer than 49 brands of Tequila. The venue also sells its ingredients to customers and will be hosting cooking classes later this year. His signature dish is carnitas (literally ‘little meats’), an aromatic pulled pork slow-cooked to a recipe originating from the state of Michoacán. Jason’s ranchera sauce is a closely guarded family secrets. All made from scratch in his kitchen. The name of the restaurant has its origins firmly in Mexico, too. 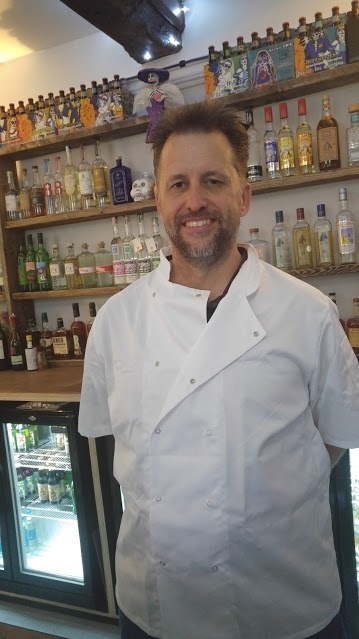 The native blue agave plant is used to distil tequila and mezcal and Jason is looking forward to sharing his knowledge and appreciation of the spirits in Blue Agave’s bar, which serves more than 50 varieties. Open late at the weekend, the bar will soon be the venue for tequila and mezcal masterclasses. This entry was posted in Drayton & Taverham, Eaton & Cringleford, Hellesdon, Home Page, Sprowston, Wroxham and tagged dining, eating out, Mexican, norwich, restaurant, Tequila on July 12, 2016 by Gay Webster.